What is the correct way to refer to LINUX/UNIX generically? If someone refers to "Windows" then everyone understands that as a generic reference to covers any or all versions of Windows. As for Macs, I have very little personal experience but I assume that "MacOS" is sufficient to do the same. Terminology is complicated because there are several Unix-like OS kernels and some flavours of non-kernel (user-space) OS software. “Unix-like” or “*nix” – anything derived from original Unix and vaguely resembling it. “Linux”, “GNU/Linux”, a “Linux distribution” – systems based on the Linux kernel. “GNU” – a collection of open-source Unix-like software, excluding the kernel, otherwise sufficient to build an OS. Can run on Linux and other Unix-like kernels. “Debian” – a distribution of open-source operating systems, based on “GNU”, united by its package management system. Variants with Linux, arguably the most important Debian, are called “Debian GNU/Linux”. Not all Debian OS variants are Linux. Ubuntu technically is a modification of Debian, not its flavour. POSIX-oriented (narrower) and POSIX-compliant (broader) – encompasses virtually all modern Unix-likes, but includes also some systems that are not Unixes internally but can run some Unix-like applications. Ubuntu is most certainly not a flavor of Debian! It is a Debian-based distribution, that's different. KUbuntu is a flavor of Ubuntu. You only call something a flavor of foo when it is a foo. Ubuntu is not a Debian so it can't be a flavor of Debian. Linux is a kernel and, combined with user space tools, can form the core of an operating system. 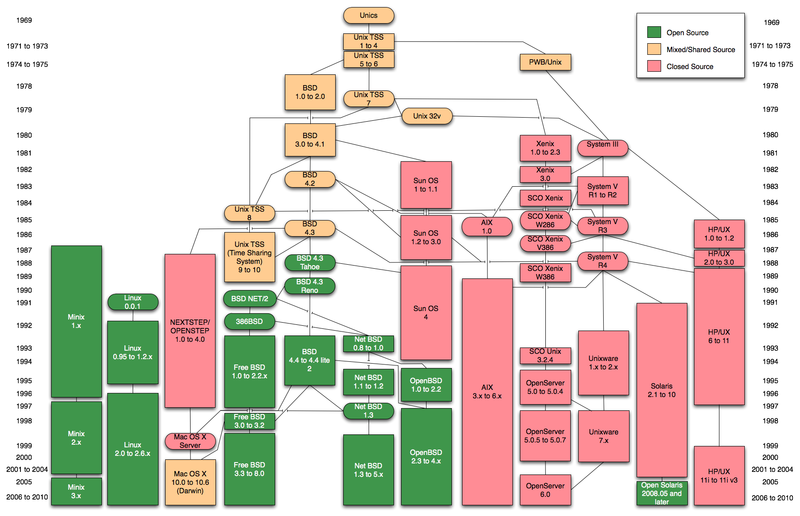 The most common such system is formed by combining the kernel with the GNU toolset. This is what most of us mean when we say Linux. According to some, it is more correctly referred to as GNU/Linux. You then have many distributions which package various bits and pieces of software together to build a full-fledged operating system. Many of these distributions are based on one another. For example, Canonical takes Debian, adds its own packages and tweaks and calls it Ubuntu. Mint takes Ubuntu, adds its own things and produces Linux Mint. These are not flavors of each other. They are just based on one another. Anyway, the generic term of all UNIX and UNIX-like operating systems is *nix (usually pronounced as "nix" or "starnix"). This includes UNIX, Linux, OSX, BSD and various other operating systems. As shared by people above, the most encompassing title would be GNU/Linux as almost all distributions have the GNU tools. You could even use GNU/FreeBSD if you are using some sort of BSD toolkit/distribution. Look forward to hearing what you finally used. Unix(trademarked as UNIX) is a family of multitasking, multiuser computer operating systems that derive from the original AT&T Unix. Development started in 1969 and announced outside Bell abs in October 1973. Linux is a Unix-like computer operating system assembled under the model of free and open-source software development and distribution. The defining component of Linux is the Linux kernel, an operating system kernel first released on September 17, 1991 by Linus Torvalds. GNU is an operating system and an extensive collection of computer software. GNU is composed wholly of free software most of which is licensed under the GNU Project's own GPL. GNU is a recursive acronym for "GNU's Not Unix! ", chosen because GNU's design is Unix-like, but differs from Unix by being free software and containing no Unix code. Development of the GNU operating system was initiated by Richard Stallman while he worked at the Massachusetts Institute of Technology (MIT) Artificial Intelligence Laboratory in 1983. Generally referring to both UNIX and Linux simultaneously is done so using *nix (the wildcard character is meant to be a clever replacement). Though in conversation "star nix" sounds a little more clumsy, but you could refer to them as "UNIX like operating systems" without being too far off. Relation is not really 'Ubuntu is flavor of Debian'. or "UNIX is father of Linux". In fact, Ubuntu and Debian are separate project sharing same package manipulation tools, building from similar sources, actively sharing improvements. But you can say that during creation ~10 years ago Ubuntu used Debian as base, but that is different thing from being 'flavor'. Yes, UNIX was an operating system name but now 'UNIX' means 'operating system which meets set of standards', i.e. single UNIX specification. Linux meets in general, but as (according to my knowledge) no distributions were actually certified as UNIX operating system, so it called 'UNIX-like'. So in general better to call Linux than you talk about multiple distributions. If you know well both rpm and deb-based distribution you can say you know Linux =). Talk about UNIX if you want to talk about whole class of UNIX-like operating systems like MacOS, freebsd, Linux. Debian, Fedora, Ubuntu (and its flavors), and other all those other distributions out there are simply all GNU Linux operating systems. Not the answer you're looking for? Browse other questions tagged linux debian ubuntu linux-mint or ask your own question. What is the correct available entropy on UNIX systems? What is the correct expression to generate the correct result? What is the correct way to view your CPU speed on Linux? What is the correct procedure to replace MDM with LightDM on Linux Mint? What is the correct Way to create new Mime Types and Icons on Ubuntu?